I am not talking about Romeo and Juliet, Lancelot and Guinevere or Paris and Helena. These two are not as widely known, but their story “is surely one of the most fascinating love-stories in the world” (Kenmare 1957:7). This is not your average Boy Meets Girl kind of story. The way in which they ‘met’ was not face to face but more.. of the face to paper variety. Nowadays, there are websites dedicated to online dating, chatting your way into love. But back in 1845, this was clearly not the case and therefore, letters were the only option. This love story began with a certain Robert Browning, poet and playwright, writing a letter to Elizabeth Barrett, poet, after finishing her latest volume of poems. Browning began his letter not with “Dear Miss Barrett” or something of the sort, he began by writing “I love your verses with all my heart” (Browning 1845:1). And what an opening that was… but his praise and love for her work is not all he poors into this first letter. He admits to having had the opportunity to see her years ago and now: “I feel as at some untoward passage in my travels-as if I had been close, so close, to some world’s-wonder in chapel or crypt” (Browning 1845:4-5). 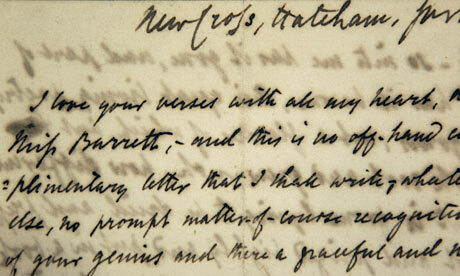 The doubt, selfcorrections and deletions merely add to the passion with which he wrote this letter. No draft for this sir, but straight from the heart! In the third week of our Letters as Sociohistorical-Linguistic Documents class, we had to look at The compleat letter writer and saw that there were also letters of courtship and love. As it turns out, there are letter manuals that solely focus on the art that is the writing of love letters. I was able to find three of them (using ECCO) that were published in the mid to late 18th century. Could it be that Mr Browning and Miss Barrett learned how to write these love letters by reading through several letter writers or were their words truly their own? Do the love letters in the letter writer even compare to a true written courtship filled with admiration, love and passion? The answer is… I have no clue whatsoever. And therefore, I feel obliged to compare the language of the love letters by Mr Browning and Miss Barrett to that of the love letters in the letter writers to see whether there are differences or similarities in their language and if there are, where they can be found. Kenmare, Dallas. (1957). The Browning Love-Story. London: Peter Owen Limited. The Browning letters are made available by the Baylor-Wellesley Collaboration and can be found on their website: http://digitalcollections.baylor.edu/cdm/landingpage/collection/ab-letters. The first picture is from http://lunamacha.blogspot.nl/2009/09/robert-and-elizabeth-browning-love.html. The second picture is from http://www.guardian.co.uk/books/2012/feb/14/love-letters-barrett-browning-valentines. Gallery | This entry was posted in 19th-century letters, letter writing and tagged Courtship, Elizabeth Barrett Browning, Love letters, Robert Browning. Bookmark the permalink.